Living on the coast, it is quite unusual to have snow, so I tend not to get too excited when it is forecast around the country. And so it was this morning, I was following my usual morning routine when Little Man rushed in to say it was snowing, I hadn’t even looked out the window! I presumed this was a little flurry but was really surprised to see lots of snow falling and the roads and pavements blanketed in white. After wrapping up warm, I left DH to do the school run and walked to work. 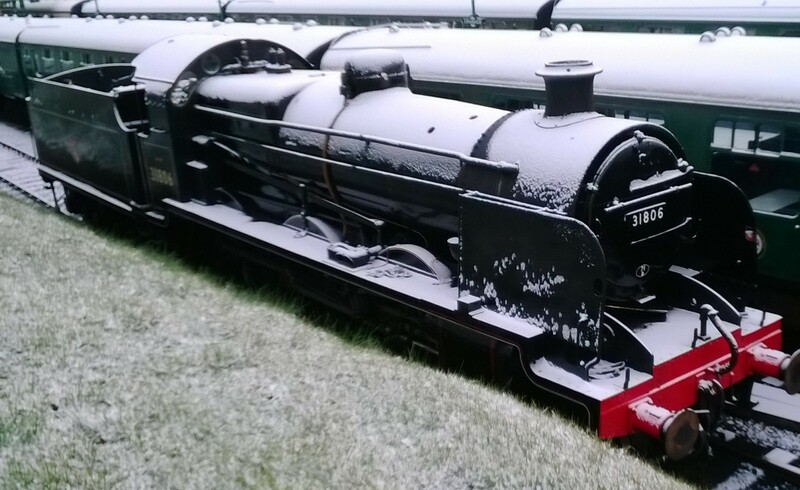 The steam trains looked beautiful covered in snow and other features which normally look so ordinary looked special. School started a little later today but once we had all arrived, we decided to make the most of the weather and had one of those amazing moments when we all piled into the playground for a snow ball fight, the giggles, screams and exhilaration, a perfect moment. Once we had used all the snow, it was back into class to dry all our soggy gloves and to warm up with a hot drink. Sadly, that was the end of the snow, the temperature quickly warmed up and by 10.30am there was no sign that it had ever snowed. However it was the memories ( and photos) of the day that will linger on, an unexpected magic moment.